Cat Ferguson continues her investigation into the drug rehab industry with a look into how marketers use online social media sites like Facebook to find vulnerable — and potentially valuable — targets. 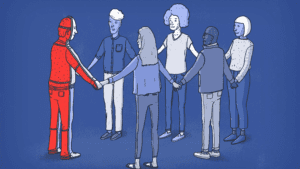 In her latest piece for the Verge, Ferguson reports on how some marketers join or start support groups on the platform and trawl them for clients, often without disclosing their financial interest in the treatment center. Verge illustrations by Laurent Hrybyk. The Fund for Investigative Journalism congratulates the Kentucky Center for Investigative Reportingand Indiana’s WNIN Tri-State Public Media on well-deserved honors for their important work. WNIN of Evansville, Indiana, won a Sigma Delta Chi Award from the Society of Professional Journalists for a yearlong investigation into a psychologist whose evaluations are under scrutiny because of concerns that some might have been falsified. WNIN’s project, “A Scar on the System: The Case of Albert Fink,” found more than 10,000 Social Security disability claims in which the psychologist provided exams or testing. FIJ will announce its next round of grants in June. The deadline to apply was May 7.